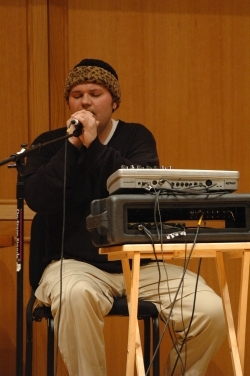 Conrad Kehn is a composer, performer, educator, and arts administrator. He is the founding Director of The Playground; a chamber ensemble dedicated to modern music. Click HERE for full bio, downloadable photos and PR materials. Scroll down for a Mix Tape of my creative work & an upcoming performances calendar. Contact me at 720-641-2414 or at Conrad@conradkehn.com to discuss. If you really want to know what I am up to follow me on social media or email me. I am available for performances, commissions, master classes, lessons and consulting. Each menu tab will provide examples of my work in these areas.  Ableton & Me. Much of my current creative work involves me performing live sets that combine spoken word and 20th centruy avant garde record samples with live vocals.  Sounds. A list of my compositions with audio and video links, and a Soundcloud playlist.  Sights. Graphic scores, film & commerical work, some visual art. Mostly images and video content.  Words. Downloadable PR materials, press, recent speaking engagements, academic papers, and some miscellaneous writing.  Projects. The groups I perform with now. The groups I used to perform with.  Young Composers. Innovative youth composition program and the focus of much of my current effort.  Teach. Want to take lessons?  Send Me Music. I'm always looking for people to collaborate with around my graphics scores or long distance improvisation recordings.